The oldest known standing settlement in North-West Europe lies on the west shore of Papa Westray in Orkney. It consists of two inter-connected 'houses' dating from the Neolithic or 'New Stone Age'. The Knap was inhabited during the same period as the famous Skara Brae site on mainland Orkney but was constructed earlier. It is also contemporary with a number of chambered cairns - elaborate mortuaries - including one on the Holm of Papay. A key to understanding the Knap of Howar is that sea levels - and, therefore, the shoreline- have changed dramatically in the last five to six thousand years.The Knap would have been some distance from the sea, perhaps part of a larger settlement. Papay (Papa Westray) might still have been connected to Westray, its larger island neighbour at that time. The name 'Knap of Howar' means the 'knoll of mounds' and describes the sandy dunes which covered the remains before their first excavation by William Traill and William Kirkness in 1929. 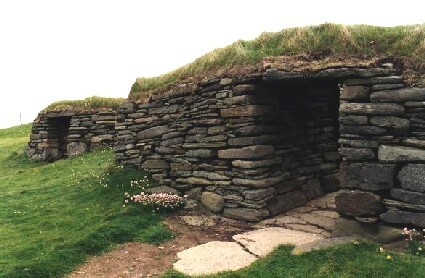 The combined action of wind and winter storms had revealed stonework and shell-packed midden (waste) which had been used to insulate the structure. They found two well-constructed, oval and inter-connected stone buildings or house structures. They thought the buildings dated from the iron age. At that time most neolithic structures were labelled 'Pict's Houses' although William Traill knew that such structures were likely to be much older than the Pictish period. The remains were left until the 1970s when fresh excavations were undertaken and the ruins consolidated by the Ministry of Works (now Historic Scotland). Excavations were supervised by Anna Ritchie. Radiocarbon dating of finds from these excavations showed, remarkably, that the Knap of Howar had been lived in between 3700 and 2800 BC. In fact. 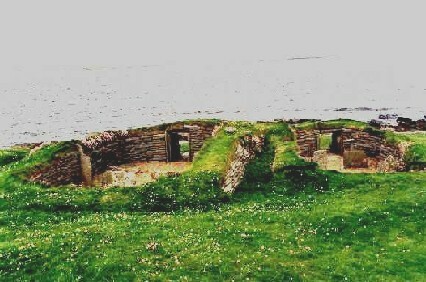 it was the oldest known inhabited structure in northern Europe! You can see from the photographs that the stonework is skillfully constructed and similar to that employed in building dykes (field walls) and 18th-19th century houses on Papay. The rock which underlies the island splits naturally into flags and blocks and requires little in the way of dressing. Post-holes were found which once housed the roof-supports. These were upto 120 mm (over 7 inches) wide. It seems difficult to believe today that such solid posts could have come from a virtually treeless island. Perhaps the climate was a little more favourable, or the posts came as driftwood. They may even have been traded across the sea. No roof debris remained within the buildings, suggesting that they had been covered with turf or thatch. The buildings were surrounded by layers of midden (waste) covering some 500 square metres. The surviving remains had been built into the oldest layer of waste (suggesting even older habitation). The midden was made of decomposed domestic waste, including fishbones, shells (mainly limpets, but also cockles, winkles and razor shells). The fish were inshore rockling, ballan wrasse and young saithe, together with cod, larger saithe and other deep-water species which could only be caught at least 2 miles out at sea. The Knap could not have been built by primitive hunter-gatherers. They were 'the products of a confident farming society' according to Anna Ritchie. What were they like, these confident farmers? 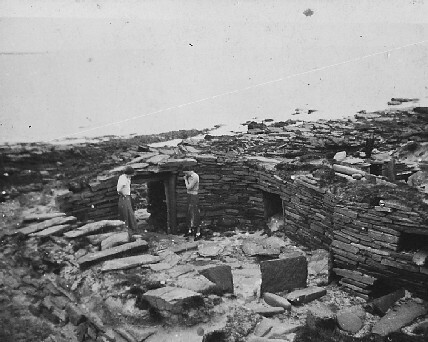 Evidence from the chambered cairns shows them to have been similar to modern Orcadians (inhabitants of Orkney). But, on average, they were slightly shorter and few lived into their fifties. They were probably descendants of mesolithic (middle stone age) people who followed the retreating ice caps through north-east Scotland, Caithness and across the Pentland Firth. 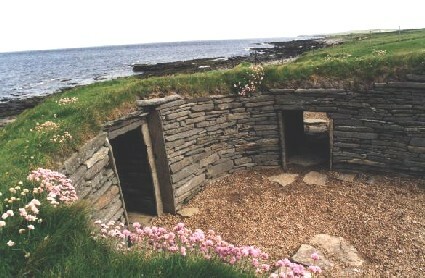 Modern humans may favour a Mediterranean-type climate but Orkney provided ideal conditions for neolithic civilisation: 'land suitable for mixed farming, building materials for permanent settlements, natural food resources and a reasonable climate' (Ritchie). The inhabitants of the Knap farmed cattle and sheep in addition to their fishing. The pottery found at the Knap of Howar is known as Unstan ware - Unstan being the site where such pottery was first found. Source:adapted from Anna Ritchie, 'The first settlers' in Renfrew, Colin (1990), The Prehistory of Orkney: BC4000-1000AD, Edinburgh University Press. > Papa Westray - photographs and information about the island.